The Project Planning and Management template is designed as a generic and affordable Excel based solution to plan and manage any project. The Project Planning and Management template is designed as a generic and affordable Excel based solution to plan and manage any project. Management of the project's budget as tasks are identified facilitates the processes of business case proposal, valuation analysis, and securing the required funding. Project dynamics can be altered and performance monitored with best practice Earned Value Analysis throughout the complete project management lifecycle. Creation of project task dependencies and timing constraint management. Pre-define project phases, task titles, holidays, and other key project planning parameters. Gantt scheduling chart with embedded project task information. 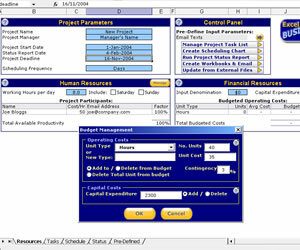 Creation and management of project budget as tasks are defined. Project communication management through participant emailing and individual workbook creation. Project status reporting based on best practice Earned Value Analysis. Project progress management by automatic updating from remote participant workbooks.